L: 48" x W: 15" x H: 32"
Brennan Sofa Table The Brennan sofa table is crafted of plank-styled wood for a rustic look. Decorative nailhead accents and antiqued black drawer pulls add a touch of style to this rugged piece. Featuring a display shelf and a storage drawer, this table will add an industrial touch to your living space. The Brennan sofa table is crafted of plank-styled wood for a rustic look. Decorative nailhead accents and antiqued black drawer pulls add a touch of style to this rugged piece. Featuring a display shelf and a storage drawer, this table will add an industrial touch to your living space. I didn't have the same experience as the previous reviewer - I was informed that the table would be unassembled at pick-up. The guys who loaded it in my car were so helpful, they removed all the packing materials for me so I wouldn't have to deal with that at home; plus I wanted to inspect it first. It was in perfect condition. It took my husband about 20 minutes to put it together and I've been enjoying it ever since. It's perfect! It goes right in a small corner in my family room. It's kind of rustic looking, kind of transitional in style...I'm so happy with it. Highly recommend. This is a great table. It is much heavier than I originally thought, which tells you that it is a high quality piece of furniture. I love the look of this table, rustic and beautiful! Nice addition to my tv/workout room. I liked the table at the store - but it was the Pick-up/condition that i was not pleased with as when I went to pick it up a few days later I found out that it was unassembled. I had to wait 2 days before I could pick it up in the first place and when I received calls telling me it was available for pickup I was reminded of the rainy weather we were having and that I might want to wait to the next day to pick it up. If it was in a box (unassembled) why did the rain matter? Which also didn't make sense once it was picked up and found to be unassembled. I was not made aware that I had to put the table together myself and when I questioned this at pick up I was told not to worry that it wasn't that hard to assemble!! How sturdy is this to use for TV on top and then dvd and cable box on shelves? 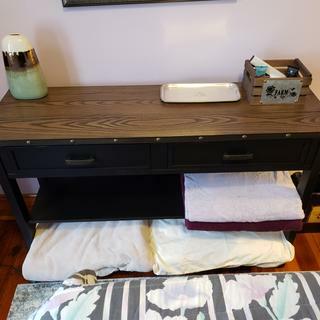 BEST ANSWER: The Brennan Sofa Table is not meant to hold those items, so it's not meant to be a sturdy table.